Today we get a look at the interior of a Chevy Equinox and we’ll recommend some mount options for a phone, GPS and tablet. The Chevy Equinox has surprisingly few choices for car mount locations. A photo of the interior of a Chevy Equinox accompanies this article. There’s not much to the interior dash. Sometimes that’s good, sometimes not. On a Chevy Equinox, it’s not so good. You can see that the owner of this vehicle decided to glue his E-ZPass to the dash. He should have read our article about E-ZPass Car Mounts. Using a windshield mount is the easiest place to put a phone or GPS. I wouldn’t attach a tablet to a windshield as it blocks too much of the view. 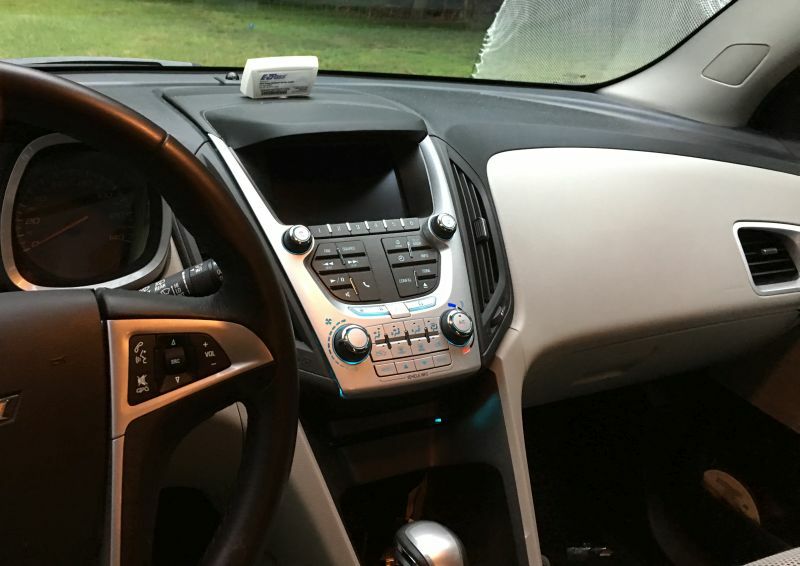 My recommendation for the Chevy Equinox windshield mount is the Arkon MegaGrip Suction Cup Windshield and Dash Mount. The suction mount features a vacuum locked suction assembly attached to a pivoting arm. The phone can swivel into any orientation. The mount also comes with an adhesive disk that you can stick to the dash to turn the mount into a console mount. The suction assembly can adhere to the adhesive disk just like it would on a windshield. This is a very reliable mount and I can vouch for it based upon my years of personal use. The vents are vertical. Good car air vent mounts for vertical vents are hard to come by. Consider the Square Jellyfish Jelly-Grip Car Air Vent Mount. The Square Jellyfish Jelly-Grip mount can be used to hold most phone models with or without a case or skin. It has a ball and socket so the cradle so has the capability to be oriented downwards towards the driver versus the roof. This mount will work on flat vent slats that are 3/8 to 1 inch deep. The included cradle opens to 3 5/8 inches which is large enough for most phones. Forget using a seat bolt mount. No seat bolt to attach to. While you can certainly use the option to bolt it directly to the floor board, most are not going to want to drill holes into their floor, so let’s move on. The Chevy Equinox dashboard is large and that’s a good place to mount a phone or GPS. You can use the two suction mounts I mentioned already as they both come with an adhesive disk so that you can use it on a flat dash surface. This option is best for states where mounting to a windshield is illegal. You can also consider using the Arkon Friction Dash Mount for SmartPhones and Midsize Tablets. This includes a cradle that opens to over 7 inches so it’s going to fit most smartphones and tablets up to the size of an Apple iPad Mini. The included bean bag weighted dash mount weighs almost two pounds and has a safety anchor which I suggest using. The device can swivel 360 degrees and will pivot and tilt. There’s no CD Player on a Chevy Equinox. No CD Player mount for you. Plenty of cup holders though so consider the iKross Cup Holder Mount for Tablets and Phones. These mounts serve a dual purpose in that a cradle for a phone and a tablet are included. The mount is adjustable and solidly made to easily handle the weight of your tablet. You will see a lot of mounts on the market for tablets or cell phones. This is the only car mount kit known of that offers two different cradles, one for the phone, the other for the tablet. You will not find a universal cradle that fits phones and large tablets. The tablet cradle will hold devices from 7 to 10.2 inches. The phone cradle opens to 3.7 inches side to side. The Chevy Equinox is moderately difficult to find good mounting locations, but we named a few. Avoid the CD player and seat bolt. Locations like the vent, windshield and cup holder are preferred.